womenforfootball.com – Less than a week left until 2014 World Cup games in Brazil, final squads of thirty two teams are now set, so it is time to dig down and analyse which team has the oldest average age, and which one carries the youngest group of players. 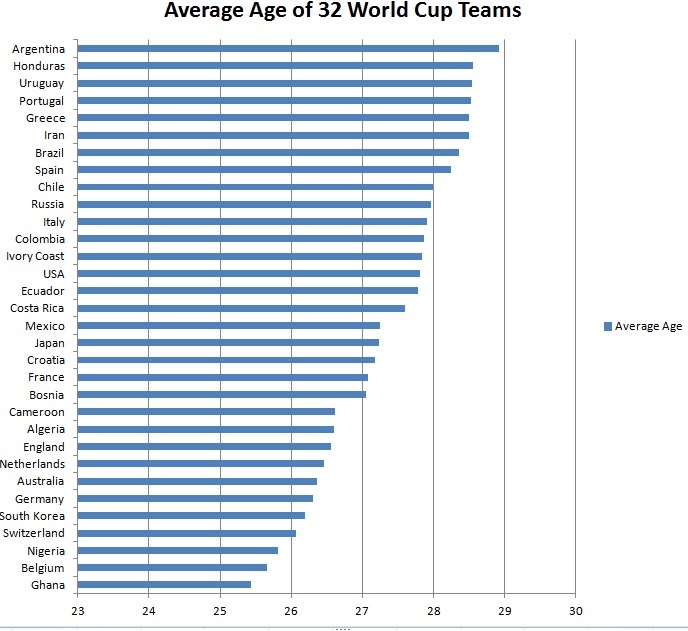 As shown in the chart below, Argentina squad has the oldest average age of 28.92, while Ghana has the youngest squad with average age of 25.44. You may ask who the youngest player of 2014 World Cup games is? Cameroon’s Fabrice Olinga is the youngest of all 736 players at the competition. The oldest player of the competition? That would be Colombia goalkeeper Faryd Mondragon, who is 42 and will turn 43 during the competition.